• Rule the Dungeon feature. ....and still under two bucks! 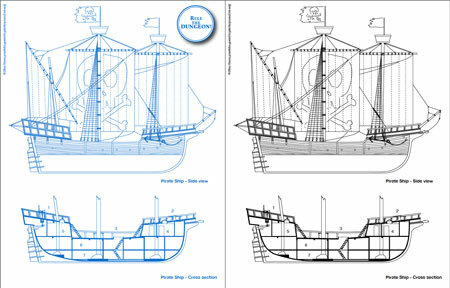 The Pirate Ship Blueprint presents a detailed pirate ship you can easily use in any fantasy campaign setting. 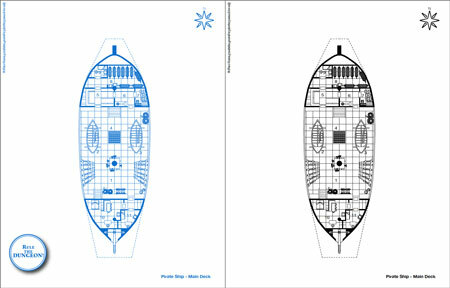 You can find al the main decks floor plans plus a side view and a cross section. The uppermost level of the ship shows two castles: the fore castle and the poop deck, where is placed the wheel. The main deck features two lifeboats and the main cabins. The captain’s cabin along with the first officer’s one are placed just under the poop deck. The captain’s cabin is by fare the bigger and more luxurious cabin of the whole ship; it features a four posters bed, a table for dinner and a desk. Under the fore castle we find the crew bedroom, the kitchen, the cookhouse, the larder and the boatswain cabin. Going further down we find the main hold level. In this hold are store the common tools of the ships such as sails, ropes, anchors, wood for repairing and a small workroom. Under this level there is the bilge, which usually is used for storage of food, wine and spirits and the like. The captain usually keeps the keys to this deck.